LifeStraws for Kyampisi and Spring Valley Primary Schools! NOAH ARK MINISTRIES - THE WAY A HOME IS TO BE! It has been over a week since my return from Uganda and I am sorry it has taken me this long to gather my thoughts to share this report. It is always so amazing to me what God does in such a short period of time, but sometimes I really do not know what to say. Then when I start, I am not sure where to stop! God's special kiss was on this trip like no other I have taken, so I pray to convey that to you. It was a goal of mine to visit Spring Valley Primary School to see and document how the projects there have been going. The boys are now moved into the dormitory and much to my delight have ample room to move and grow! There are not as many girls boarded at the school, but they also have more room now, as does the school for classrooms. They have also installed doors and windows on the existing classrooms, built a fence around the school and installed a front gate. They built brick structures to house businesses in hopes they will generate income for the school. Because of the offerings given this ministry, we were able to deliver food to them, to the school in Musisi, as well as to a school in Jinja. There was also a door opened to me to teach at Christianity Focus Centre which also broadcasts the messages repeatedly on six radio stations around Uganda. The pastor of this church, Bishop David Kiganda, spoke to me in depth then blessed me before releasing me to teach at his church. I believe because of that, a strong prophetic word was released about the people being aimed by the Lord to hit the bull's-eye. In that one short week, I could sense the spiritual atmosphere change over Uganda! The Lord has always been good to reveal His faithfulness in answering prayers for Uganda upon each of my return trips, but this trip I sensed it immediately. Praise God! To make this possible these were donated by the Rotary Club of Ft. Lauderdale, Florida working in conjunction for their distribution with the Rotary Club of Muyenga together with its makers at Vestergaard-Frandsen in China. It took our staying in constant communication, which was not easy, to make it possible to deliver 1200 LifeStraws to the children in outlining villages like Kyampisi, Natete and Kosovo, Uganda; places with polluted drinking water. Since the outbreak of the waterborne disease Typhoid Fever has been particularly bad in these areas, we were more than pleased to have been able to deliver them. I do want to thank my sister, Victoria Briggs, for instigating this project on behalf of the children of Uganda. As well I thank Martin Brody, Dr Catherine Sagala, Sam Mwanje and Paul Chen for their coordinated efforts and gracious hearts. Together we got this done! A special thank you is in order for Pastor Gary Warner of Legacy World Missions http://www.legacyworldmissions.org/ who not only connected me to the Rotary Club in Uganda, but also provided me with a vehicle and driver AND the use of his cell phone while there! What a HUGE blessing that was to make this trip come together. Thanks to Charles for your great driving and sweet disposition. A big thank you to Mercy, Aisha and Nancy for opening their home to me, cooking, keeping me filled with fresh pineapple, washing, translating at different places, driving me when Charles wasn't, and loving me so sincerely. Even when my trip was extended, they insisted I stay with them. I am so grateful for you! Thank you to Rev. Kevin Muwaya and Pastor David Kalasira for your tireless efforts to organize the Pastor's conference, and thanks to all who opened their doors to me to share with their people; Pastor Mike I need to mention you and Pastor David Okecho and my beloved Momma in Musisi. It is always a blessing to minister at your churches and see your families again. Thank you Pastor Frank for translating at two conferences and on Christianity Focus radio. Last but not least, thank you my most precious Omusumba; you are a continual blessing to me for too many reasons to list here. However I do want to bless the work you have been commissioned by the Lord to lead. It just is too intense and lovely and wonderful for words. I have been so very blessed by how you have kept your head up when some, who walk in vainglory, sought to knock you down. You make your mother proud! You have kept your eyes on your King and your ears open to the leading of your heavenly Father who loves you and called you according to His purpose. Godspeed, son! There are so many involved in this trip, but if it were not for those who sowed their hard-earned money to send me none of this would have been possible. Your gifts have contributed to its success. You may not be able to go to the mission field yourself, but by sending me you will share in the reward of it. God bless you and thank you so much for believing in me and in the mission of sharing the Father's love. I pray not to leave anyone out, but the One who cannot be forgotten is Jesus the Christ who has given us life and life in abundance. To Him be given all glory both now and forever. Amen! AIDS and other diseases like malaria and typhoid fever, wars and accidents have decimated the adult (working age) population in Uganda. 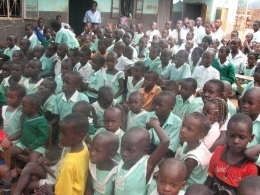 These pictured here are a small number of children who are blessed to be in a school, but many of them are orphaned and are themselves ill with AIDS. Malaria is a constant threat to the children as many do not have screened windows or mosquito netting over their beds. They live in poverty unimaginable in the Western world, yet they are able to smile - even in their situation. You may also give with a credit card by going to the home page and click the "donate button" for PayPal. Every dollar sent will be multiplied there about 10x what it would be in the States. You can clothe a child and feed them for a month for about $30. That is equal to a couple going out for a simple dinner in the US.